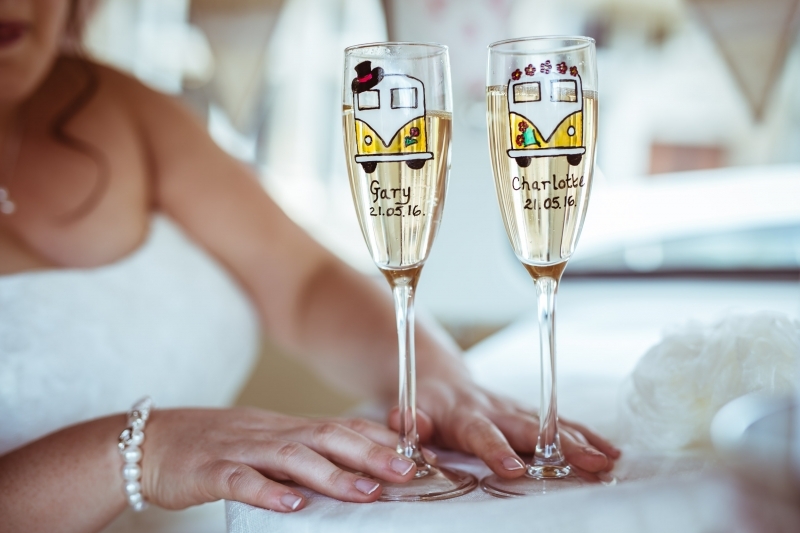 Pair of VW Campervan Hand Painted Champagne Flute Wedding Glasses. The glasses are individually hand painted which makes each set unique and they are baked to make them dishwasher safe. A cute design which shows VW campervan in wedding attire but still retaining the iconic image of these love bugs. A perfect gift for campervan enthusiasts who are getting married or a brilliant idea for a wedding anniversary gift especially for the 3rd year which in modern themes is glass. They can also be personalised with names or individual messages to make them an extra special gift. The glasses are supplied in a White cardboard box with a clear plastic front ideal for presentation with tissue paper included. Additional bubble wrapping and cardboard will be added when the glasses are packaged but this can be removed once the glasses are ready to be given as a gift. Please note glasses are hand painted to order and sets will take a minimum of 5 days to produce. "Canny Campers, Paul and Julie Thank you for all your help and guidance while planning our wedding car. The campervan looked amazing in our pictures and the personalise..."
"5 * Thank you so much for your service. This company truly goes above and beyond to make the wedding experience as pleasant and relaxed as possible." "Just wanted to say a huge thanks for your service with the camper van for our wedding. Really appreciated the time and effort you put in. Hope you manage to build u..."